The End-Matcher model GPS-90 is designed for tongue and groove and interlocking engineered flooring. GPS-90 enables you to create or recreate complex setups in a matter of minutes and hold these machining setups within very tight tolerances, board after board… after board. The End-Matcher model GPS-90 is designed for tongue and groove and interlocking engineered flooring. GPS-90 enables you to create or recreate complex setups in a matter of minutes and hold these machining setups within very tight tolerances, board after board... after board. It is designed to End-Match random length flooring of various widths and thicknesses. It features a traverse bar conveyor with machining centers on opposite sides of that conveyor. Two sets of "side-shift rollers" embedded in the traverse bar conveyor align or realign the boards ahead of the machining centers. A third set of rollers is used to outfeed boards at the exit end of the machine. It is suitable for machining Tongue and Groove profiles on the opposite end of the boards. 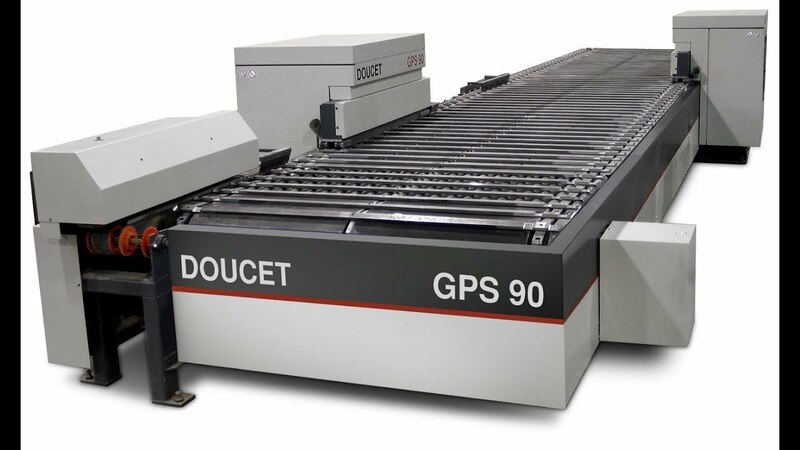 They feature machining centers equipped with saws for trimming blocks, machining the top and bottom tongue and cutting the matching groove. The trim saws and the top and bottom groovers are "climb cutting" tools rotating in the same direction as the direction of feed, thus avoiding chip out on the back side of the floor boards. The horizontal groover rotates against the direction of feed. In addition, the GPS Model can be configured to machine interlocking "Click" or "Snap" profiles. Even-ended for maximum length up to 120"